People have been comparing Trump-land with Germany in the 1930s. I get it. A populist nativist with fascist tendencies is currently the President, supported by a range of racist white nationalist and supremacist groups. On a personal note, I happened to be reading Phillip Roth’s The Plot against America, which details the rise of a populist nativist with fascist tendencies in 1930s America, right at the time that Trump announced his campaign in 2015. I tend to read novels slowly; a few minutes in bed each night, and so the plot of the book played out against the backdrop of Trump’s ever-weirder and scarier campaign. The parallels were there, and like I said, I get it. But…for me 1933 is the wrong parallel. In Germany in the 1930s, there were simply no corporate equivalents to Amazon, Expedia or Microsoft, lining up against German state racism. The conventional establishmentarian components of civil society were not condemning Hitler’s targeted policies against Jews and other minorities. There were no protests at deportation sites as there have been at airports across the US this week. And so whilst I don’t doubt Trump’s fascist tendencies, I do think that falling down the rabbit hole of 1930s Germany throws up a number of problems. It fails to help us understand what is happening at the moment, it leaves us struggling for ways to stop it, and it reinforces a historical frame of reference that erases helpful comparisons that might be drawn from outside of Europe, particularly with regards to struggles against European colonialism and White supremacism. I believe that a much closer historical parallel with current events in the US would be South Africa at the end of the 1980s. It is no coincidence that Apartheid ended in the same period as the end of the Cold War. Whilst domestic opposition to the regime was of course vital in its demise, such opposition and civil disobedience had been a key component of domestic anti-Apartheid struggle for many years prior to 1990-1994. The big difference is that the end of the Cold War removed the geopolitical justifications deployed by the West in supporting an overtly racist regime. South Africa could no longer be seen as a ‘bulwark against communism’ in Africa; trade with and investment in such a regime, and ignoring that regime’s crimes, especially in the face of such widespread protest from within and outside South Africa, could no longer be justified on those similar grounds. The result of all of this was a loose and to an extent unintended coalition of interests; social movements committed to the liberation of peoples of colour; elements of the State no longer able to prosecute the actions necessary to uphold an Apartheid regime; and very importantly, capital, whose owners saw that Apartheid, in a post-Cold War world, would not be good for business. Of course the end result of this loose coalition was a victory for capital. The majority of non-White South Africans are unemployed; many live in impermanent housing and are regularly threatened with eviction. A small non-White minority have made a lot of money, and the White-European minority, those who owned productive capital in the first place, have not experienced a great deal of change in their material circumstances. Fundamentally though, the end of Apartheid signalled a blow against White supremacism, the idea that light skin automatically equates with intellect and material privilege. And whilst the post-Apartheid reality has not lived up to that idea, the idea is no less powerful, particularly because it was an idea that so many people fought for. Donald Trump, alongside being a megalomaniacal misogynist, is also a White supremacist. One can be a White supremacist and still evince warmth towards people of colour, because racism works in generalities before projecting onto individuals. Hence ‘I’m not a racist, some of my best friends are Black, Muslim, Jewish, etc.’ So yes, Donald Trump’s daughter and son-in-law are Jewish. This means he can’t be a racist anti-Semite right? Wrong; because he still engages in generalised anti-Semitic tropes. Opposition to him springs in part from opposition to his White, male supremacism, and as such a contingently more hopeful comparison with end-of-Apartheid South Africa rather than pre-Shoah Germany makes more sense to me, emotionally as well as analytically. As much as we are at the beginning of the Trump presidency, there is a strong whiff of the end of something too. Already, the component parts of the coalition of interests that ended Apartheid in South Africa are present in the US today, from the Amazons to the Expedias, to the State Department officials protesting Trump’s executive order on immigration, to the liberal components of civil society like the Sierra Club or the NAACP, to the radical social movements like Black Lives Matter, plus countless others. And like in South Africa, if successful, this loose and contradictory coalition will most likely deliver most for the interests of capital, for institutional and societal racism in the US did not begin with Trump’s election, and higher incarceration rates, nor police brutality against African Americans and other Americans of colour are likely to end when the curtains come down on this Trump presidency. Nonetheless, and with all of that in mind, an end to Trump, or a constitutional curtailing of his most egregious racism and misogyny, would remain significant. Donald Trump could start World War Three and invalidate any hope that one might draw from reorienting our points of comparison away from Europe, and towards an anti-colonial, and anti-White supremacist moment. However, given what we can know at this moment in time, I believe that comparisons with 1930s Germany reinforces a Eurocentric historical gaze that fails to deal more fully with Trump’s White supremacism, and the rare coalition of interests that have emerged as a response. Given the limitations of the post-Apartheid regime in South Africa, hope might be the wrong word to use in this context. Rather, I think what the comparison gives us is a time-bound and highly contingent model of resistance. It is not the only one (not least we might consider the US’s own 1960s civil rights movement), but it is one worth taking note of. It wasn’t about the tour guide, I was just feeling a bit sensitive about this kind of thing when she said it. I had been chaperoning a bunch of students around Brussels as part of a quick tour of European Union institutions, and in amongst the “to your left you can see…” patter on the bus (although more of that below) came an explanation of why there were 12 stars on the European flag, about how even when the EU expanded beyond 12 member states they had retained the 12 stars, and that this was because 12 was such a significant number. There had been 12 Olympian Gods, 12 hours in the day (and of course the night), and 12 apostles; said fact was then grounded in the following nugget of European ahistoricism and not-so-covert racism: “and, you know, our culture is still Christian, I must say” (stress in the original). Now, like I said, this piece isn’t about that tour guide, nor do I think it is particularly sensible to extrapolate any broader point about Eurocentrism, racism or ahistoricism from one single individual. But my inside voice was screaming – How could you square a singular expression of European historical Polytheism and Pantheism with contemporary exclusivist Christianity? 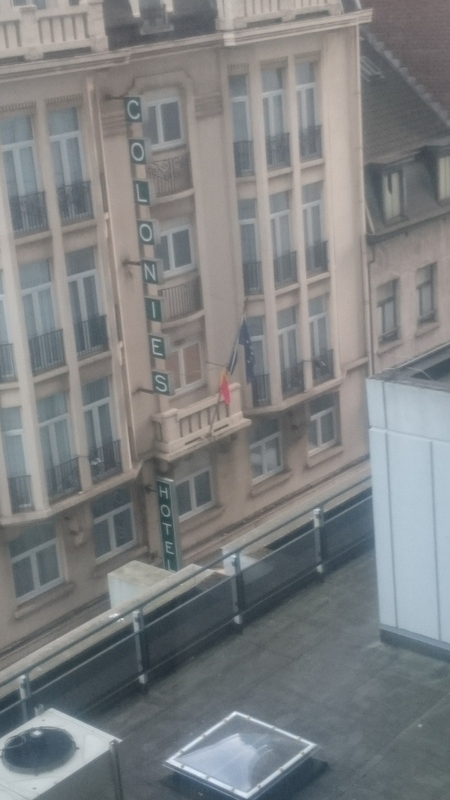 And then, my mind raced around the Brussels that I had been seeing, for the first time, over the previous 24 hours, and thought, Wow, the absence of what slavery was and is to Brussels is even embodied in its people. Now, I know, that was pretty unfair. One person an’all. But like I said, I was feeling sensitive. I’d never been to Brussels before, and it’s certainly a beautiful city, its historic centre untouched by World War Two bombing. But it’s when you get out the very centre, and start to get the tours of the royal palaces, Chinese Pavilion, Japanese Tower, Europe’s largest greenhouses, the Parc du Cinquantenaire, and so on, that you begin to get a material sense of just how much of Brussels was and is bathed in the blood of Congolese rubber slaves. For these sites were the projects of Leopold II, known to some in Belgium as the ‘Builder King’, and many more both inside (I hope/imagine) and outside as a megalomaniac despot and butcher who robbed and murdered the inhabitants of what became known as the ‘Congo Free State’ in the latter part of the 19th Century, the legacy of which is arguably still being visited on its successor state, the DRC, today. It is of course the case that much of the supposed architectural splendour of Europe’s capitals is similarly bathed in the blood of slaves and other imperial subjects. And yet the silence which surrounds Leopold’s crimes in his own heartland is astonishing, all the more so because, unusually in the case of Imperial Belgium, there really is one person that stands out to be held responsible for the crimes against the Congolese, the self-same and heralded ‘Builder King’ Leopold II. On our tour we were told of Leopold’s hilarious escapades and vanities, like spending 100,000 Gold Francs on the Chinese Pavilion built for the Paris Exposition of 1900 (equivalent to roughly $1.5 million today). Not a single mention of where Leopold raised the funds for this, and the variety of other urban projects and public works Leopold commissioned in the late 1800s and early 1900s, when his personal wealth mushroomed thanks to the rubber producing personal fiefdom he had established in the Congo. Now, I know that you can consult a Wikipedia page to find some of this out, and I’m fairly certain, from memory, that Adam Hochschild makes a similar point about the absence of its own bloody history one encounters in Belgium, but the point I want to convey here is how visceral this absence is. It’s everywhere, inscribed in the pillars of the rather unaptly named Palace of Justice (commissioned under Leopold II’s father, but completed, in all its grandeur, many years later in 1883 under Leopold II’s rule) and written into/out of official public histories of the period. Whose words are these words? Subaltern, indigenous, victim, oppressed…who are they used by, why and for what purposes? Taken out of their immediate and parochial political context can they convey more general analytical purchase? Questions like these can be unsettling, probing as they do the very heart of any number of critical scholarly projects. We invoke with language but with every invocation we also exclude. Representation, in the Spivakian sense, is not always undesirable, but it is risky, the subject always mutable and mutating. These then are some thoughts on how we might pursue what other contributors to the CPD workshop called a critical ethic of engagement. First, we must be more willing to call out racism and paternalism for what it is. When the forces of the far right can claim to be speaking for ‘indigenous rights’ it becomes clear that even language claimed by critical scholars is not unproblematic. When peoples dubbed ‘indigenous’ are reprimanded by paternalistic scholars and/or activists for appropriating elements of ‘modern’ economy and technology, we know that labels can be used to subject rather than liberate. Of course, when the subjects of racism, paternalism and oppression claim the subjectivity of indigeneity, victimhood, or (much less likely) subalterity, in order to amplify and pursue their political demands then that is another matter. But here is precisely the point. Racism and paternalism are racism and paternalism. When those subject to such prejudices decide to appropriate the language of indigeneity or subalterity in how they respond to such impositions then contingently supporting and thus learning from such endeavours can be a mode of ethical engagement for critically minded scholars. When those scholars start to decide who and what counts as indigenous, subaltern, and so on, then the risk of creating far more problematic modes of representation which silences and disempowers the very subjects whose (preconceived) liberation is being sought becomes much more amplified. A second mode of comprehending a critical ethic of engagement with the subjects of racism and paternalism is to work on becoming parochial. But not a parochial form of parochial-ness! Being parochial is not about being local, glocal, or any other such spatial imaginary. Rather, being parochial is a call to decolonize our sense of selves as autonomous, liberal rational subjects, and to comprehend the social relationality and historicity which produces our contemporary selves. Such a comprehension is always an immanent work in progress, but one through which we can begin to work on ourselves, to develop more horizontal ethics of engagement which predicate against the tendency (especially in the academy) to see ourselves as sources of liberating expertise, a well-meaning but ultimately paternalistic route. How does my horizontally and historically constituted self, replete with its own oppressions and privileges, enable me (or not) to enact relationships of solidarity and empathy with other equally contradictory selves? What are the limitations of my empathy? When does my positionality turn away from enabling liberation to enabling new forms of oppression? Similarly, what new forms of relationality are opened up by my consideration of my self (selves) as multiple, historical and horizontal? How might this sense of self/selves allow me to dissolve modern distinctions of expert/subject, teacher/student, educated/uneducated, civilised/uncivilised, whilst still retaining a reflexive sense of my privilege to have the time and luxury to even ask these questions of myself? It’s taken a few weeks but I’ve finally gotten around to posting some reflections on this year’s ISA convention in New Orleans. Due to a particularly interesting conference theme around ‘Global IR and Regional Worlds’ the schedule was fuller than usual with panels on postcolonial and decolonial thought. Indeed, for someone with an eye for these things it seemed like everyone was suddenly becoming decolonial. From one mention in the 2013 programme, to two mentions in the 2014 programme, the 2015 programme featured the term ‘decolonial’ a stonking 14 times! …Ok, so not exactly a storming of the North Atlantic IR barricades, but those fourteen mentions of course brought fellow travellers speaking to similar issues even if not directly referring to the term. And in any case it was striking to me that so many people amongst a certain quotient of the ISA crowd were talking in these terms (and I include myself here; I certainly wasn’t thinking about issues of decoloniality a year or two ago). Why does any of this matter? Robbie Shilliam has eloquently written about what possible futures (based on silenced histories) might be invoked through a ‘decolonial science’, and yet it felt at ISA that there was still a great deal at stake in terms of defining how such a science, whose mission is nothing less than to heal relationships ripped asunder by imperialism and colonialism, might be carried out. This was encapsulated for me (and I must stress that this was very much a personal impression, driven by the kinds of issues I’m interested in at the moment) by some comments made towards the end of a panel where precisely these issues were being debated. One of the panellists commented thusly (and I am paraphrasing here): We can deconstruct colonial thought with European ideas, but we cannot reconstruct decolonial realities with those same European ideas. On one level this made a good deal of sense. If the point of a decolonial science is to heal relationships ripped apart by a set of Eurocentric colonial and imperial projects, then to try to do so by routing back through a set of Eurocentric ideas seems counter-productive, re-establishing in some ways the original violence of imperialism and colonialism. Another way of putting this would be to entirely reject the notion that oppressed groups in post-colonies should be reading Marx as a vital way of understanding their predicament. On another level though this, for me, was a slightly provocative statement (not one I was anywhere near articulate enough to raise at the time!). For it is surely important to ask, what is ‘Europe’ in this statement? Where and when is it? If an idea has been produced in the territory that has historically been known as ‘Europe’ by a member of an oppressed and excluded group, then might that idea and those experiences relate to oppressed struggles elsewhere? Indeed, is this not the point of ‘decolonial science’? To heal, and rebind those who have been violently torn asunder by imperiality and coloniality? To put it another way, we would surely reject as a fairly concrete case of romanticisation the notion that just because an idea has been produced in a place which we think of as being colonised, that this makes it an inherently emancipatory idea. And so it seems to me that the challenge of a decolonial science is to make a normative judgement about who has been oppressed and silenced, regardless of where they were territorially located at any particular time. This would allow us to draw new lines on a map, to make connections between silenced histories of struggle and resistance the world over. I am again thankful to Robbie Shilliam for the following insight. Imperial maps like the one below, illustrating British Imperial might in 1886, is ringed by both agents of the British imperial project, and subjects of the British imperial project. Note how both the agents and the subjects have their gaze directed to the regal figure at the centre-bottom of the image. This is perfectly understandable for the agents of the imperial project, for it is this centre from which they have come. But the subjects have not come from here, and what is more, have had their gazes forcibly fixed on this figure through the violence of the British imperial project. What of their conversations with each other? What of the lessons they may have for surviving and prospering beyond and otherwise to the various imperial and colonial projects they have all been subjected to? From this image we would never know, precisely because their gaze is fixed on the centrality of British imperiality. This is the decolonial project then, to remove that imperiality and to resurrect old centres, old conversations, old ways of being and doing in a dynamic present. But to ignore those subjects of imperiality and coloniality who have experienced the violence of these processes within territorial Europe, or even a Euro-centric context, seems to me to be missing an important opportunity to reject those same territorial distinctions made so hard and fast by colonialism and the post-colonial compact. In very many general ways this obviously has a lot to do with Africa, African spaces and African voices. But at the same time, my own way into this has been through a very different path, the writings and ideas of 19th and early 20th century German-Jewish Anarchists, a group who derived their ideas from an explicit sense of Jewish exile, but who also celebrated that exilic experience as something to be retained and perpetuated as a means by which to facilitate broader revolutionary-utopian change (in this sense that they operated beyond the more standard route of socialist-Zionism taken by better known radical figures of this period such as Martin Buber and Gershon Scholem). Their Jewishness, and their opposition to Germany’s role in World War One, saw them quickly painted as dangerous Others. The fact that they spent time with well known ‘Eastern’ Anarchists such as Kropotkin and Bakunin simply added another layer of Otherness to their presence in Germany. Their ideas concerning the inward journey to communality, the rejection of scientific rationalism, and the transcendence and thus displacement of the secular/profane schism on which the project of modernity was supposedly founded were all, for sure, derived from a European experience, but one which was simultaneously lived as one of exclusion from what was understood to be ‘European’, and oppression. Indeed, Gustav Landauer, the figure from this period I am currently most familiar with, and a protagonist of the short-lived 1919 Bavarian Soviet Republic (Until taken over by Leninists, it was far from Soviet), in whose government he took a post as Commissioner of Enlightenment and Public Instruction, was arrested on the dissolution of the republic, taken to prison, and beaten to death. We can and should be critical of what we find when we open up these silenced European histories. But surely the same goes for any silenced or oppressed history. Indeed, in enacting what Edouard Glissant called ‘prophetic futures’ we are called to be attentive to past, present and future. This is an inherently critical project which precisely rejects any kind of romanticism which might paper over residual paternalism or racism. But nonetheless, could recentring that map above include people like Landauer, or indeed various other resisting, dissenting, and otherwise-living subjects of Europe’s own internal imperial project? For me, it certainly should. Africa’s middle classes: Who are they and (why) are they important? Continuing our New Year: New Questions theme, Clive Gabay explores the idea of the middle class in Africa, building on an earlier blog in the same series from Sara Rich Dorman. Clive is a Senior Lecturer in the School of Politics and International Relations at Queen Mary’s University, London. As Sara Rich Dorman recently wrote on this site, we have heard and read a lot about Africa’s middle class in 2014. However, the celebration of Africa’s apparently new middle classes dates back further, to the rash of analysis proclaiming Africa’s rise which has been percolating, in its contemporary form, since the late 2000s. Celebrated as both a cause and effect of Africa’s economic growth, they have also been heralded as the root of Africa’s political rise and ‘maturation’. It is therefore right to step back, as Sara Rich Dorman does, and consider whether this is more than just the projection of a mythologised Euro-centric experience onto African societies. For as much as the African middle classes may be driving anti-graft and pro-democracy protests in places as diverse as Malawi and Nigeria, it is also true that in these places, and others, class mixes with ethnicity to produce complex and counter-intuitive political stances, and that for at least some members of this rising class the keys to state power and resources are proving more attractive than notional principles of democratic right. For instance, Malawi has seen three presidents in the last three years, each one siphoning off those elements of civil society and the business community which supported their ascent to power, leaving discontent to rumble along amongst the divided remnants of these protest movements. As much as these questions are important, they also feed into a broader set of questions which are worth considering as we push into the second half of the 2010s. If we take a broader historical view, then we can see that this is not the first time that elite groups in Africa have been subject to the optimistic coverage of Western commentary. Indeed, in the late 18th/early 19th centuries, educated Sierra Leoneans were incredibly popular with the British colonial government. They rather rapidly fell out of favour once they started demanding inconvenient things like land and voting rights. In their place came un-Westernised tribal leaders, compliant with British rule and willing to perpetuate colonial governance in return for resources to underpin their legitimacy. And so the procession continued. We know of course that indirect rule, dependent as it was on the reification of tribe and clan, ensured that educated, Westernised, petty bourgeois Africans were viewed with suspicion by colonial authorities. However, by the 1940s the increasing popularity of modernisation theory amongst colonial bureaucrats led to a revision of this position. Tribalism was now viewed as backward, and inimical to colonial development, whilst educated, Westernised Africans were now seen central to the continent’s development. I would hesitate to call these Africans ‘middle class’, because, as Sara Rich Dorman pointed out, post-colonial African elites formed more of a ‘political class’ than a middle class. Reflective of Western norms concerning the role of the state at that time more broadly (vis-à-vis the morality of the state), it is now not surprising that Western commentators celebrate the emergence and agency of the ‘entrepreneurial’ middle classes as a reflection of the contemporary neoliberal conception of the state as a facilitator of markets and entrepreneurialism. We can perhaps speculate then that the emergence of much of this ‘Africa Rising’ rhetoric about the emergent African middle classes has at least something to do with the sluggish and stagnant performance of economies in the West. Important questions to ask then include whether this fascination with the African middle classes will become unstuck as evidence mounts that they are as politically divergent (and extraversionary) as middle classes in many other parts of the world. And whether this fascination is a transient stage in the West’s long history of fixating on one particular African social group as vehicles of Africa’s development. What Achebe is saying may sound overly generalising, but that is only because mainstream political and cultural representations of Africa tend to be so generalising, flitting from pessimism to optimism, in turn revealing something about metropolitan illusions and extravagances. As another Nigerian ‘great’, Wole Soyinka, has recently written in his new book On Africa, the West is constantly careening between hope and despair, Rwanda and Mandela. It is in this constant flitting that I would extend Achebe’s analysis, for whilst the West’s ideas about Africa can be seen as always having been a process of narcissistic projection, if such a projection is periodically pessimistic and then optimistic, this must involve both the successful transference of deep-seated Western insecurities about its own short-comings onto Africa, thus cleansing them from the Western social psyche (as Achebe argues), as well as the projection of Western insecurities which construct an image of Africa as containing the solution to the West’s problems. This helps explains why the Western reproduction of Africa swings so wildly between optimism and pessimism. When pessimistic, Africa is constructed as a place of violence, religious conflict, disease and despair, all features of Europe’s not so distant past, but which get emptied out of Europe as a current issue of concern and projected onto Africa. But what of Afro-optimism? We are, indeed, in a time when Africa’s stock in the West has rarely been so high. Celebrations of African culture proliferate (film festivals, literary festivals, and so on), whilst a whole industry of policy and investment guides proclaim Africa’s ‘rise’ as an economic, political and demographic powerhouse. For those who can cast their minds back 20 years, to the coverage of Somalia, Rwanda, and the breaking of the HIV/AIDS pandemic, such proclamations seem curious. Indeed, whilst current commentators celebrate the ‘demographic dividend’ of Africa’s population boom, in 1994 Robert Kaplan could write his infamous piece in the Atlantic Monthly where he predicted Africa’s coming anarchy based in large part on…yup, Africa’s population boom. 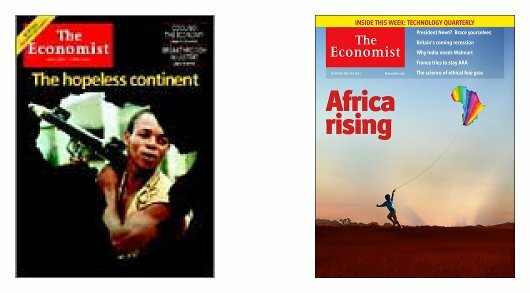 More famously still are these two front covers from the Economist Magazine. The first, from a 2000 edition, the second, from 2011. Leaving the problematic imagery of both images aside for another blog post perhaps, what is striking about these front covers is the absolute about-face they represent in a period of little more than a decade. I would suggest that this turnaround is not a straightforward acceptance of Africa’s internal diversity, and sameness vis-à-vis anywhere else in the world, but is in fact yet another staging post in the narcissism which has historically informed Western and specifically metropolitan representations of Africa. Indeed, optimism about certain aspects of African culture, history or politics (when such things were ascribed to Africans, an admittedly rare occurrence) have always accompanied and constituted the imperial encounter with Africa. To claim that imperial imaginations of Africa have been straightforwardly derogatory is to miss the huge optimism about Africans with which 19th century missionaries and humanitarians approached the continent. Once we recognise this we have two options: one, to accept such attitudes as reflecting a perspective on Africa distinct from more mainstream perspectives of the period, or two, to delve into these perspectives and explore their relationship to conventional forms of racism and paternalism. For whilst missionaries were hugely optimistic about African morality, this was only because they expected the Africans they encountered to appreciate God in ways which the European Christian ‘flocks’ from whence the missions were sent, with their drinking, gambling and fornicating, seemed increasingly immune to. Missionary optimism about Africans then was almost solely based on a collective narcissism regarding moral decay in Europe, and disappeared pretty quickly once Africans turned out to be quite fond of their own belief systems, and not so different from anyone else in the attention some of them paid to, well, drinking, gambling and fornicating. What this means for now is that we need to question contemporary narratives about Africa’s economic rise, which have emerged in the context of a Euro-American economic crisis, or about Africa’s ‘demographic dividend’, which have emerged in the context an aging European population with under-funded social welfare provision. This is not to say that (some of) the things these narratives are describing aren’t true, but to question the timing of these analyses, and relate them to a longer history of quite violent swings between optimism and pessimism which have characterised the imperial relationship to and representation of Africa. Is Africa rising? A bit of a silly question for a continent which spawned humanity, but by contemporary socio-economic measures, a hugely qualified yes, for some people, in some parts of the continent, depending on who you ask, and when. Was Africa on a precipice of barbarism 20 years ago? Of course not. It is the narcissism of a metropolitan commentariat which has changed in the meantime, far more so than conditions for many of the people living in Africa. As midnight approached on 30 May, the eighth day following the closure of polls in Malawi’s 20-22 May elections, it was unclear whether the country was about to be tipped into yet another − and this time possibly irrevocable − political crisis. Under electoral law, the electoral commission had eight days to count votes and its deadline was fast-approaching. However, it had more to worry about than just checking ballots. On 24 May, it emerged that Peter Mutharika was leading with 42%, with 30% of votes counted. This compared closely to a pre-election Afrobarometer poll, so it was largely assumed that Mutharika would emerge victorious. But President Joyce Banda had other ideas. She declared that there had been mass rigging, that the electronic vote-counting system had been hacked (it had, in fact, crashed rendering it inoperable a day after polls opened), and said she was annulling the vote. She announced that new elections would be held, but that this time she would not stand. Her decision not to run was seen by some as a selfless act that chimed with the idea, held by many in the West, that she represents a new kind of African leader. But the fact that her proposal was completely unconstitutional seemed to point to another possible interpretation. Nevertheless, other trailing candidates soon joined the bandwagon and issued their own demands for a full recount and launched court injunctions seeking to prevent the Malawi Electoral Commission (MEC) from releasing any more results. At the same time, Mutharika’s Democratic Progressive Party (DPP) launched its own court injunction trying to get the MEC to do the absolute opposite − i.e. release the results within the eight-day period. The MEC itself announced that it wanted to perform a recount based on numerous voting irregularities and sought a court order to extend the constitutionally-mandated eight-day counting period to 30 days. To add even more heat to matters, a coalition march of pro-recount parties in the lakeshore town of Mangochi on the morning of 30 May clashed with police, leaving one protester dead. As night-time fell on 30 May, there was consequently a lot riding on what High Court Judge Kenyatta Nyirenda would decide. At 10:30 pm his announcement finally came. He initially announced that the MEC was entitled to perform a recount, seemingly giving hope to those who opposed a Mutharika victory. However, that hope was swiftly crushed as Nyirenda said that any such recount would have to be performed within the commission’s eight-day counting period. In other words, if the MEC wanted to manually recount around 7 million votes, it had an hour and a half to do so. And so it was that just before midnight, at the last possible moment, Peter Mutharika was announced the winner of Malawi’s elections. He was sworn in the following day. For those who get most of their news about Malawi from Western media organisations, the election results may have been quite surprising (aside from all the unexpected drama). After all, Joyce Banda had been warmly welcomed by much of the international community when she ascended to the presidency in 2012 and was admired by many around the world. At the same time, there seemed to be many reasons to suggest Malawians would not want to vote for her main opponent, Peter Mutharika. For one, Mutharika has spent most of his professional life outside Malawi. He is also the younger brother of Banda’s predecessor, the late President Bingu wa Mutharika, who became increasingly authoritarian through his rule. Finally, at the time of elections, Peter was also on trial for a range of charges including treason. This latter charge referred to his actions when he tried to block then Vice-President Banda’s inauguration after Bingu died unexpectedly in April 2012. So how did Banda go from being the apparently beloved Madam President to not just losing the election, but coming third? On the one hand, the answer comes down to the fact that Banda’s reputation in Malawi is quite different to her image in the West. Far from being the breath of fresh air many international figures assumed her to be, Banda consistently acted just like any other Malawian politician in her position. For example, she made grand gestures at the beginning of her presidency about how she would do things different, but was at the same time distributing sacks of maize stamped with her initials from state-owned vehicles. Added to this, there was also the infamous Cashgate scandal in which around $100 million of donor aid was looted from government coffers. Banda came under much criticism for her handling of the scandal, there were allegations of her possible involvement, and calls for her resignation grew. There is also an important international dimension to Banda’s domestic unpopularity. Bingu wa Mutharika had become more and more repressive whilst in office, but what tipped the scales against him internationally was his refusal to devalue the kwacha, the local currency. One of Joyce Banda’s first decisions as president was to do just this. She devalued the currency by 34%, causing the prices of many goods to soar by as much as 50%. Two years after taking office, Banda lost much of what popularity she had. She was seen to have acquiesced to international demands and made life more difficult for poor Malawians in the process. She was seen to be as happy to buy votes as any other Malawian politician. And the Cashgate scandal pointed to the possibility that she was happy to use her position of power enrich to herself, or at least that she was too incompetent to stop others in her cabinet and party from doing so. In fact, the unresolved issue of Cashgate may have been the main motivating factor behind her fairly peculiar call for the elections to be repeated and her accompanying vow not to run in them. While Banda clearly would have wanted to win the elections, it seems she was even more keen to ensure Mutharika did not. After all, it was her government that arrested him and put him on trial, and with the Cashgate investigation still ongoing, Banda perhaps fears that Mutharika will return the favour. It remains to be seen if she will be reassured by his offer of an olive branch since being sworn in. Malawi’s 2014 elections have been messy, with none of the major protagonists emerging with much credit. Whilst Malawi’s democratic institutions did finally come through, they took a long time to do so, and it still seems that there were some serious irregularities in the polls. The new president is a politician with a track record of underhand dealings, and his new government will rule a divided country. The Joyce Banda hailed by the international community in 2012 was defeated, though in reality the figure she was imagined to be by many Westerners never existed. The people of Malawi knew this all along, and made it abundantly clear at the polls.